Come along to our Wednesday Testimony Meeting to hear readings about this topic and listen to or share experiences of healing through prayer alone. This talk by Christian Science practitioner, teacher and lecturer, Michelle Nanouche titled “Angry no more: from hurt to health through forgiveness”, offers insights that neutralise pain and anger. 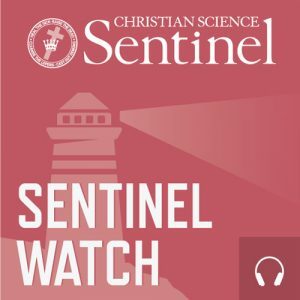 On the upcoming edition of Sentinel Watch, we answer questions about wrestling with doubt. A hymn in the Christian Science Hymnal reads: “O Love, our Mother, ever near, / To Thee we turn from doubt and fear!” (No. 232). Our guest will answer questions that you have sent in via our website, JSH-Online.com, on how a better understanding of God's all-defining grace heals doubt. The challenging problems we face today demand a fresh approach to solutions. We can’t afford to overlook the needed component of spirituality to make real progress on the issues that confront our lives and well-being. Find out why there is more to health and healing than merely physical factors at this free public lecture by Michelle Nanouche, CSB. On this episode we look at a novel way of struggling with an addiction. And that’s to stop struggling. That might seem impossible when you have been losing the struggle with some long-standing habit for months, years, or even decades. But you can hear how that was the healing answer that came to our guest as she prayed, and how it made sense as she understood, accepted, and proved what it means to be a child of God. Many people are looking for better health and a deeper, more meaningful way of life. Practitioner and teacher of Christian Science healing and international speaker Michelle Nanouche says, “Spirituality isn't just a lifestyle choice. It is the basic element of true being.” Michelle will discuss a view of God that Christian Science offers: that God is divine good and only good. Christian Science practitioner, teacher, and lecturer, Michelle Nanouche will be a studio guest on the "Searchlight" program, and will respond to listener questions on the topic of "Angry no more". Speaking from personal experience, Michelle offers insights that neutralise pain and anger. Michelle Nanouche, practitioner of Christian Science healing and international speaker, will present her talk, “Angry no more: from hurt to health through forgiveness”.